I've told my friend, Renu, no at least a dozen times, but she enrolled me anyway. It's not a race, she insists; it's getting glitter and paint-bombed, and some money goes to charity, so stop being so greedy. Fun-run peer pressure is a growing stress in my life, with fundraising races pretty much every weekend around Boulder. Maybe the participants are moved by the excitement. Maybe they just want to share the pain. Maybe I want to choose my own kind of pain. Don't get me wrong. I'm not anti-race. Philanthropy is a top priority in my life. And I'm (probably) not the antichrist. I just would prefer to do (fill in the blank with any activity, including pushing myself down the stairs) than run. In fact, those are all fundraisers in my town. There are plenty of unique ways to raise money that don't require running shoes and that stupid paper bib. Hooters for Neuters: A handful of Hooters restaurants in Georgia raise money for various animal welfare organizations, including Operation Second Chance -- Jail Dogs and Save a Litter Pregnant Dog Rescue. The goal is also to raise awareness about the importance of spaying and neutering your pets. Naked Ziplining: The ZipZone Adventure Park in Canada organizes an annual Go Bare In the Air Naked Ziplining event -- for women only -- to raise money for the Canadian Breast Cancer Foundation. Feb-U-Hairy: You've heard of No-Shave November and St. Baldrick's. Here's a new way to use hair for a cause: A group of Newfoundland women don't shave their legs throughout February to raise money for cervical cancer. Stop the Bop: Various RelayForLife teams have played Hansen's "MMMBop" song on repeat until they raised a certain amount of money. One team raised $50 for the American Cancer Society in four minutes, and another $300 in 15 minutes. The Bacon Fest: This annual event raises money for the Rehabilitation Institute of Kansas City, via a bacon-eating contest and bacon recipe contest. A past winner: bacon apple pie. Tater tot eating contest: Bacon not your thing? Bar Louies around the country hold annual "Rock the Tot" tater tot eating contests to raise money (ironically?) for the Share Our Strength No Kid Hungry campaign. In addition to raising money, the event has earned Bar Louie the world record for the Most Tater Tots Eaten Simultaneously. Dance Marathon: Boulderite Michael Capitelli is gearing up for the Dance Marathon April 5 at the University of California, Los Angeles, an annual event that raises money for pediatric AIDS. He's bringing a variety of shoes to change into and a tennis ball to roll on his feet when they grow weary. The annual Yogathon: On May 17, Naropa University's Nalanda campus holds a Yogathon, to raise money for programming in low-income schools. The event includes 108 sun salutations led by 10 different teachers, a DJ, other yoga classes, food and a silent auction. 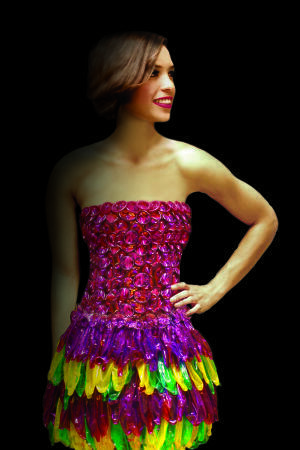 Condom Couture: The Boulder Valley Women's Health Center holds an annual super safe fashion show, featuring clothing made entirely out of condoms.